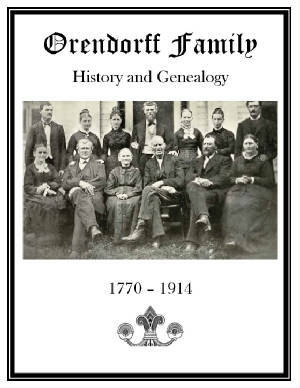 The following families have genealogy eBooks on this page: Bird, Chambers, Cornish, Derby-Darby, Dare, Dart, Forman, Griffing, Heinecke-Vandersaal, Houghton, Lenher, Merrill, Mesick, Orendorff, Scammon, Shethar Families. Welcome to Bookshelf 22 at Hawkeyes Trading Post! Bird Family History and Genealogy. PDF eBook English 1.00 1903. 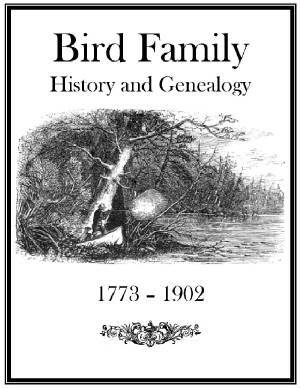 The Bird family genealogy begins just prior to the American Revolution in 1773, and stretches up to the year 1902 in this detailed account. There are 6 generations listed on this 16 page publication, which includes a very informative ancestral chart. There may be unique information regarding kinship ties in this edition, which might not be found elsewhere for the Bird family genealogy! Price $6.95 USD. 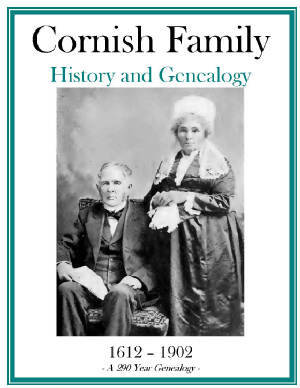 Cornish Family History and Genealogy. PDF eBook English 13.5 MB 1907. This well articulated genealogy brings fresh insight to one of Americas early colonial families. There are 10 generations listed with essential dates and names ranging from 1612 up to 1902, short biographies on many descendants, 10 rare ancestral photographs, and an index of 35 pages containing thousands of descendants and in-laws. Print out the photographs for your own picture frames! 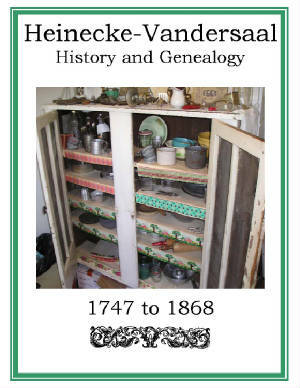 Truly a magnificent reference for the family genealogist covering 290 years! Price $6.95 USD. Dare Family History and Genealogy. PDF eBook English 4.42 MB 1901. After many years of exhaustive research the descendants of William Dare were compiled into this book. Essential dates range from 1682 up to 1901, which documents 6 branches of the Dare family. He was among the first settlers, and became the Sheriff of Salem County, New Jersey, in 1703. 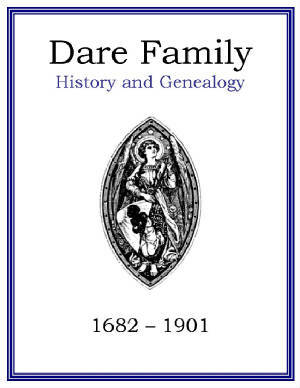 Rich with family history, and certainly a treasure for the Dare family genealogist! Price $6.95 USD. 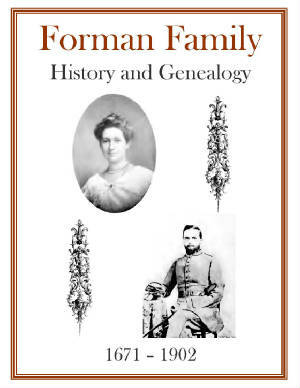 Forman Family History and Genealogy. PDF eBook English 9.27 MB 1903. Contained in this excellent composition are the descendants of Robert Forman of Kent Co., Maryland who died in 1719/20; Robert Forman of Long Island, New York who died in 1671; and the Forman family of Monmouth County, New Jersey. Essential dates and names of descendants stretch over 230 years from 1671 to 1902. Documentation provided includes Last Will and Testaments, and a great resource in the index which contains over 300 names of descendants and in-laws! The ink has faded somewhat on the old pages, yet very readable for obtaining the family history and genealogy. 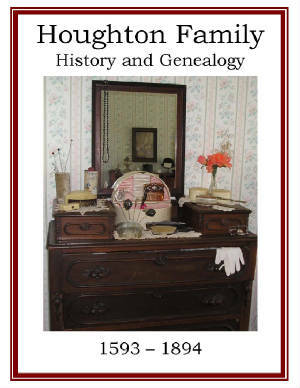 A wonderful resource for the family genealogist! Price $6.95 USD. Heinecke Vandersaal Family History and Genealogy. PDF eBook English 8.88 MB 1869. The Reverend Heinecke provides his family genealogy from 1747 to 1868 along with the in-law genealogy of Henry and Elizabeth Vandersaal. Also, the genealogy is provided from Adam to Christ with biblical references. An evangelist, the author provides interesting adventures during his travels along the dusty roads of colonial America. A great link to the past for the Heinecke or Vandersaal genealogist! Price $6.95 USD. 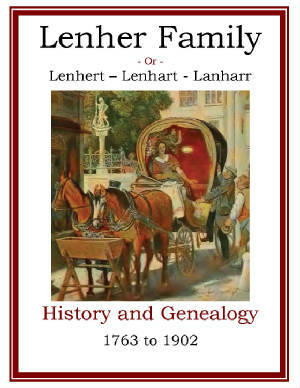 Lenher Family History and Genealogy. PDF eBook English 2.87 MB 1903. The family genealogy begins with Philip Lenhert who dwelt near Ephrata, Lancaster County, Pennsylvania during the American colonial period. Tombstone inscriptions for he and his wife are provided, and both inscribed in the German dialect with a poem on their markers. Their surname became Americanized over the years with variations of Lenher, Lenhart, and Lanharr. There are 24 pages providing essential dates and names for a period of nearly 140 years, from 1763 up to 1902! This great reference may feature rare genealogical information not found elsewhere! Price $6.95 USD. 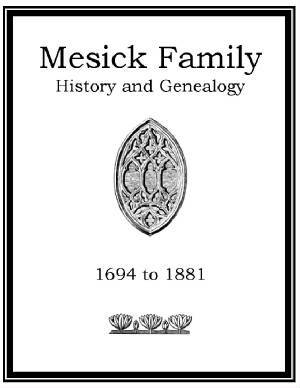 Mesick Family History and Genealogy. PDF English 1.62 MB 1888. The nucleus of this genealogy was supplied by Thomas Mesick in 1840. There are 6 generations of descendants from Ffitz Muzigh who was born in 1694, with essential dates and names from 1694 up to 1881. The surname has varied from Muzigh, Musig, Musick, Mesig to Mesick over the centuries. There are 46 pages packed with essential genealogy that may be unique to this publication! An essential resource for the family genealogist! Price $6.95 USD. 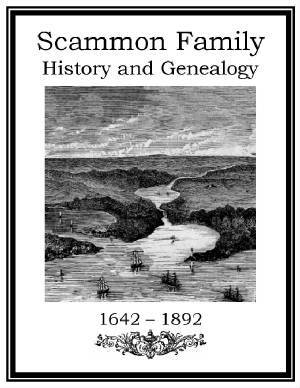 Scammon Family History and Genealogy. PDF eBook English 1.30 MB 1892. The family genealogy begins with the arrival of the Scammon family in Portsmouth, Maine during the colonial America era. Sometimes the name is written as Scamman. An accurate record per the author of the family descent from 1642 to 1892 providing 6 generations and 250 years of documentation! Great information on one of Americas long standing colonial families, that has since expanded throughout the world! Price $6.95 USD. Chambers Family History and Genealogy. PDF eBook English 1.14 MB 1899. Rowland and Elizabeth Chambers with several children arrived in the American Colonies about the year 1720, and settled on the eastern bank of the Susquehanna River below Harrisburg, Pennsylvania. There are 18 pages tightly typed on an old manual Remington typewriter which provides essential dates, and names, of Chambers family descendants from the year 1720 up 1896. 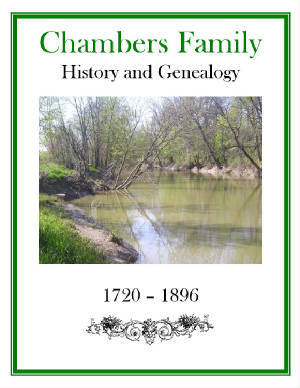 A great resource for the Chambers family genealogist! Price $6.95 USD. 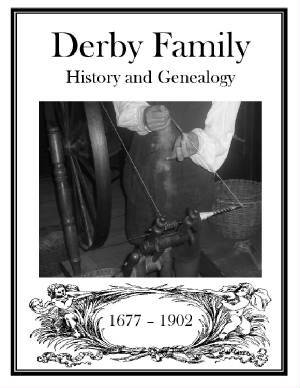 Derby Family History and Genealogy. PDF eBook English 1.60 MB 1902. John Darby, the surname being interchanged over the years to Derby, was born in England, and in his early manhood departed his homeland to seek his fortune amid the novelties and wonders of the American New World. Although the ink is somewhat faded on this 20 page genealogy, with 10 generations covering a period from 1677 to 1902, it is still very readable to document family ties. Perhaps this rare genealogy may extend your family line back for many centuries, or untangle relationships from past decades! Price $6.95 USD. Dart Family History and Genealogy. PDF eBook English 0.86 MB 1888. 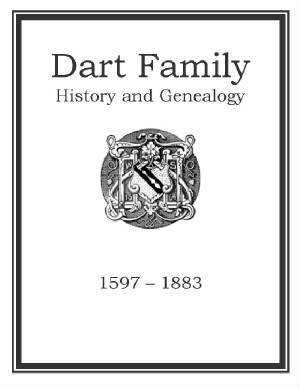 The history of the Dart family, also spelled Darte in old English, or Dort in German or Dutch, ranges from 1597 up to 1883 in this great link to the past! Descendants of Joseph Dart, born about 1775, are likely listed per church records in this 14 page family reference. This is a source of centuries old Dart genealogy that may not be compiled elsewhere! The Dart family genealogist may discover another century of information! Price $6.95 USD. 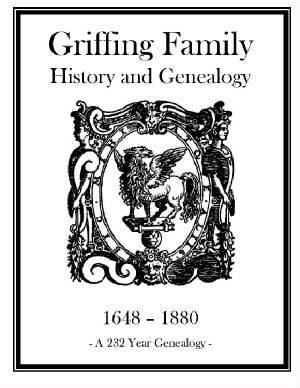 Griffing Family History and Genealogy. PDF eBook English 9.342 MB 1881. Jasper Griffing was a native of Wales and came to the American colonies about 1670. In the Colonies he married Hannah and they had 18 children. There are 8 generations documented in this tale with essential dates and names ranging from the year 1648 to 1880! Also, a 22 page index lists over 1500 names of Griffing family members and in-laws! This is a treasure chest filled with genealogical information! Price $6.95 USD. Houghton Family History and Genealogy. PDF eBook English 7.12 MB 1896. Captain Timothy Houghton migrated from Boston, Massachusetts to Chester, Nova Scotia, in 1759. Essential dates for his ancestors and descendants stretches from 1593 up to 1894 in this excellent composition! The genealogies of many in-laws are also provided in a family group format that covers over 300 years! A source of important documentation to extend the family genealogy! Price $6.95 USD. Merrill Family History and Genealogy. PDF eBook English 2.53 MB 1907. Barzilla Merrill was a pioneer in colonial America who lived in a log home near Stephentown, Rennsselaer County, New York. He and his immediate family are buried on the Merrill family farm near Fabius, New York. There are a few rare ancestral photographs along with essential names and dates on descendants which span the period from 1764 up to 1907 in this excellent composition! 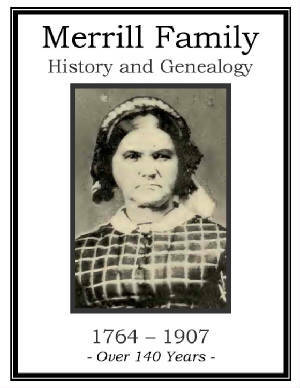 This is a source of essential Merrill genealogy for 140 years with roots to the family origin! Price $6.95 USD. Orendorff Family History and Genealogy. PDF eBook English 0.89 MB 1919. Christopher Orendorff was born in Maryland about 1770 of German-Swiss heritage. His descendants included twins Joseph and Benjamin born in 1804. Earliest date of family member Johann Christian Orendorff was his name among passengers aboard the ship St. Mark on September 26th of 1741. The Maryland Census of 1790 is also referenced with ancestral information; and other essential dates and names range from 1770 to 1914 on Christopher Orendorffs descendants. Although only 10 pages in length this centuries old genealogy may contain unique information not to be found elsewhere! Packed with information! Price $6.95 USD. Shethar Family History and Genealogy. PDF eBook English 1.92 MB 1904. John Shethar arrived in the American Colonies from England in 1639. The family groupings are excellently arranged with many short character sketches, along with essential dates and names from 1639 up to 1902. Covering a period of over 260 years, there are family letters, and an index of over 250 descendants and in-laws. 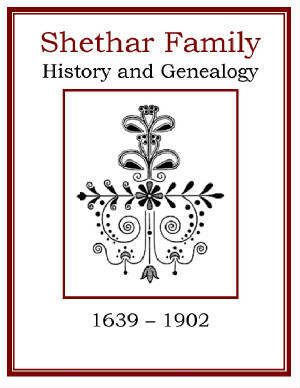 An essential resource for the Shethar family genealogist anywhere in the world! Price $6.95 USD.